Georges Braque is a quite and talented soul. People that knew Braque mention how often he “dedicated to quiet periods in his studio rather than to being a personality in the art world” (ArtStory, 2014). Despite his humble personality, he made a revolutionary impression with his collaborated creation, CUBISM. Georges Braque and Pablo Picasso started a form of art known as Cubism. In the early 20th century, our world was changing quite rapidly with new developments in medicine, travel and the industrial revolution. According to George and Pablo, they continued to see change all around them but little, if any, change in their art world. Bored of the old type of work and painters drawings, they decided to create something new. There are two main types of Cubism, Analytical and Synthetic, each with unique artistic characteristics. Analytical Cubism – When Cubism began, it was called Analytical Cubism. An artist would take a subject such as fruits, furniture, or a persons profile, and they would study it until they could break the subject into little blocks or squares on their canvas. The artist looks at the art blocks from different angles and reconstructs the subject by painting them from different view points (see The Round Table). Synthetic Cubism – Using some of the same techniques mentioned in Analytical Cubism, Synthetic artwork uses various materials to create an ABSTRACT COLLAGE. Artist can use colored paper, newspapers and other printed materials as geometric blocks of the subject (see Aria de Bach by Georges Braque). Although Braque’s art partner is more famous and was clearly a visible personality in the art world, we will always remember Georges’ important contribution to the history of art. Georges Braque was a French painter, collagist, draughtsman, printmaker and sculptor! Look at the quote above. What do you believe Georges’ is trying to say with his words? Which art piece is your favorite? Note the details within the art piece and explain why you chose it. 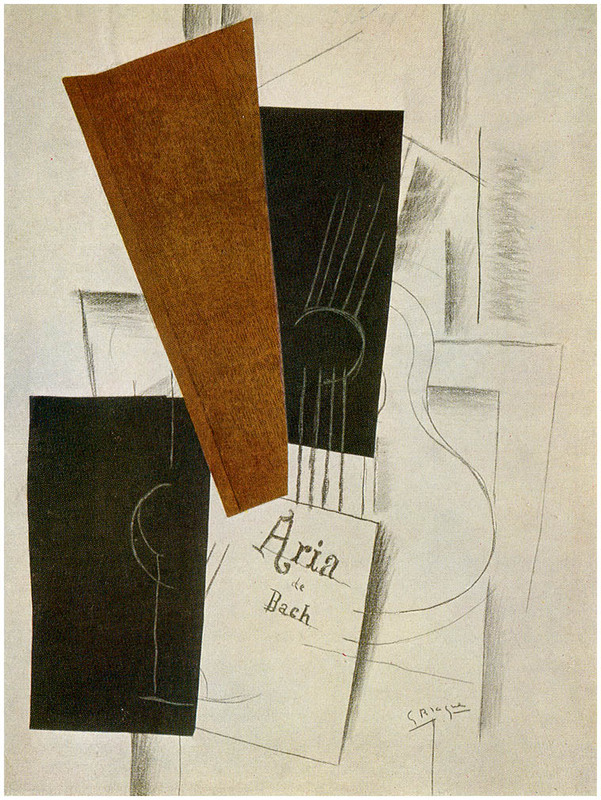 In honor of Georges Braque’s painting Aria de Bach, enjoy Johan Sebastian Bach’s beautiful Aria (song or suite) on classical guitar. Hello Isaiah. You are most welcome. way is there only 2 Thoughts? I think he means don’t repeat what other people do.